Hit-and-run accidents have been on the rise in major cities in recent years, spiking more than 13 percent in a recent three-year time frame. In some places, like Los Angeles, it’s so bad that half of all crashes in the city involve at least one driver who fled the scene. In total, these accidents kill about 1,500 people a year – disproportionately affecting pedestrians and bicyclists. In fact, 60 percent of hit-and-run fatalities are pedestrians. Several states, including Texas, Florida, Arizona and Colorado have increased criminal penalties for hit-and-run drivers. In Massachusetts, M.G.L. c. 90 s. 24 makes failure to stop after a collision a misdemeanor, with a maximum penalty of up to 2 years in jail, a $200 fine and between 60 days and 1 year of license loss. Of course, that assumes the driver got caught. So here does all this leave Boston bicycle accident victims? It will depend heavily on the circumstances of the case. If the driver is caught, there may be an opportunity to pursue several avenues of liability. First, we would look to see what kind of insurance the driver has. Specifically, we want to know the bodily injury coverage limits and property damage limits. In some cases, we will find that the driver doesn’t have much insurance or any insurance at all (this may have been why they fled in the first place). In that situation, we would take a couple different approaches. First, we would look at whether the owner of the vehicle is someone other than the driver. In some situations, the vehicle owner could be held vicariously liable. In cases where the driver was drunk, we could look at a dram shop law or social host liability action, if alcohol was negligently served to that individual. Now, let’s say none of those is an option or the hit-and-run motorists is never caught. The next thing we’d want to explore is the cyclist’s own insurance coverage. 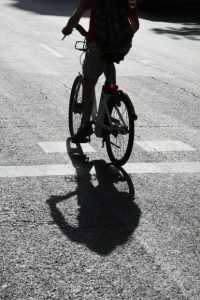 The law does not require bicyclists to carry insurance the way it does motor vehicle drivers. However, if a bicyclist has auto insurance with uninsured/ underinsured motorist coverage, that policy will still cover the insured, even if he or she was on a bike and not in a car. But of course, many bicyclists in Boston don’t carry auto insurance because they rely on their bicycle as their primary form of transportation. In that case, it’s a good idea for cyclists to carry bicycle insurance. It’s worth it to point out that some homeowners’ insurance and renters’ insurance policies will cover certain losses for things like theft, property damage and maybe even medical bills. However, bicyclists can purchase their own stand-alone bicycle insurance policies to protect them in the event of a Boston bicycle accident. It’s smart to get covered, especially if you rely on your bicycle as a primary form of transportation. It’s important if you are a bicyclist injured in a hit-and-run accident to contact an attorney to discuss your legal options.